MARLBOROUGH, MA--(Marketwired - Mar 18, 2014) - ADCOLE Corporation has upgraded their automatic camshaft and crankshaft surface finish gage for the factory floor with a new Siemens motion control system in response to broader global acceptance. The ADCOLE Model 1000 Surface Finish Gage provides automatic and repeatable surface measurements on the factory floor and has been upgraded with a Siemens Sinamics motion control system to assure optimum customer support. Featuring pushbutton control, an operator can load a part, press one button to start and have all surface measurements such as Ra, Rp, Tp, and Rsk performed in one sequence on main and rod journals and thrust faces. Built on a rugged platform of structural steel and granite, the ADCOLE Model 1000 Surface Finish Gage uses three stylus tips which are capable of scanning 2,000 points per nm. Users can perform gage repeatability tests and reproducibility (GR&B) tests, prove machine capability, and qualify produc-tion equipment such as automatic polishers. Average cycle time is six minutes and statistical data is maintained using Q-DAS and qs-STAT. The ADCOLE Model 1000 Surface Finish Gage is priced from (US) $190,000.00. Price quotations are available upon request. 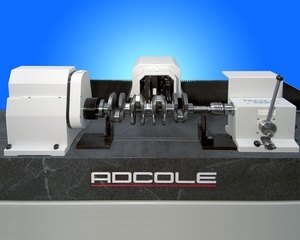 Adcole Corporation is the global center of expertise for designing and manufacturing the world's highest accuracy machines for measuring camshafts, crankshafts and pistons, as well as digital sun angle sensors for space satellites. No other company can better measure critically important reciprocating engine components or the angle to the sun. Founded in 1957, Adcole has manufacturing facilities in both Massachusetts and Florida and offices across the world, maintaining close relationships with their customers. The company's success, to a large extent, is based upon responding to their customers' requests for further refinements based upon their real-world experience. Most of these refinements have dealt with the need for higher accuracy and the need to measure more parameters including radius, profile, taper, crown, timing angle, diameter, velocity, acceleration, runout, and roundness and concentricity. ADCOLE Corporation has upgraded their automatic camshaft and crankshaft surface finish gage for the factory floor with a new Siemens motion control system.